Teach your German Shepherd to play Frisbee? First of all, it is a fantastic way to keep your dog in excellent condition. Not to mention you! Frisbee is also an excellent sport to promote cardiovascular development. The running and jumping involved in this sport works well to improve muscular strength and prevents misdirected energy in an otherwise bored German Shepherd. However, this is best done with older dogs, not German Shepherd puppies whose bones and joints are still developing. And by older German Shepherds I mean at least a year of age or older. 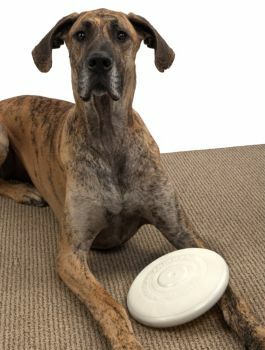 Check with your vet about your dogs health first before beginning frisbee play and training. Chasing those flying disks is also great for a dogs eyesight as well as stimulating your dogs mental acuity and provoking it's need to chase! While both improving and strengthening the GSD's vision, it also helps your German Shepherd to track and focus all it's attention on a small moving object, where you are in relation to that object, where the object is going, about where the dog plans to catch it, etc. And all of this thought process happens in just milliseconds. If you have a German Shepherd that enjoys playing fetch with a stick or ball of some kind then you can expect that your dog can easily be transitioned to catching Frisbees with a little practice. There are three basic skills needed to play Frisbee: Throwing, Catching, and Retrieving. Dogs especially love playing with Frisbees because the discs can hover in the air for a long time and also because frisbees can be very challenging for the German Shepherd to catch. • Avoid playing in areas where your activity will attract the attention of other dogs. • Always play with a safe, undamaged disk and do not leave your GSD alone with the disc - it may decide to eat it. • Know your dog's limitations. • Always play on the best high-quality well-grassed flat fields you can - areas without holes or other potentially dangerous areas. • Never throw frisbees near fences, trees or other obstructions. • Never throw a frisbee where two or more dogs might chase it. • Playing frisbee should only occur during the day or in well lit areas. Participating in any dog related sports activity, in this case playing Frisbee, as a team promotes camaraderie between both the owner and the German Shepherd, and creates a very tight bond of friendship between the participants. It gives the German Shepherd as well as you something to look forward to. Best of all, all Frisbee competitions are open to all breeds of dogs - regardless of breed type or size. All dogs can compete "paw to paw" - it doesn't matter if it is a mixed breed or a purebred canine. This activity is meant for all to have fun at while enjoying the companionship of your best friend. Most dogs really love it! And if you’re good at it, all the better.